It's time for our annual Fall Extravaganza episode. An entire show dedicated to our freakish love of fall. Fall is taking over the internet. We loved what Meagan and Sarah and Kelle had to say about it, so we're weighing in too. We talk all about what fall is truly like here in the desert. We're fall-ifying our houses with Mrs. Meyer's Orange Clove Dish Soap, Bath and Body Works' Sweater Weather, Pumpkin Apple, Leaves candle scents and Bright Autumn Day, and Crisp Morning Air soap and hand cream. We test our fall sniffers with a blind smell test of a fall candle. Our littles are even playing with homemade pumpkin spice playdough, and reading Halloween books, and playing with seasonal toys and Kelsey's cooking up her favorite lentil soup. We celebrate Falliday with the exchange of traditional Falliday gifts, and dish about how we're celebrating Halloween this year. Erica's loving the book, Happiest Toddler on the Block which is changing her perspective on raising a 2 year old cavewoman. This reminded Kelsey of the Janet Landsbury's Unruffled podcast on parenting toddlers. 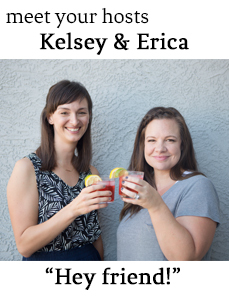 In neighborhood news, Kelsey is very disappointed that the census man has not shown up on her doorstep yet, and Erica had a very awkward non-meeting of the new neighbor. There are some very creepy neighborhood Halloween decorations, and Kelsey is very excited about Nextdoor, a private online social network where you can connect with your neighbors.